If Mr. Mandela were a Nigerian, not only would he be in a foreign hospital, he would commandeer an entire wing of the said hospital. No government official would ever give Nigerians updates on his progress or prognosis. Hell, no! In fact, the only statement the government would ever issue is to deny that the man is hospitalized. Some spokesman would insist that the old man went abroad on vacation, to get some well deserved rest. You see, Nigerian officials – from the president down to the municipal chairman – are fond of boasting that they’ve “totally transformed” Nigeria, this or that state, or this local government area or another. Yet the last thing these human transformers would ever do is take a vacation in the country they’ve ostensibly transformed! If Mr. Mandela were a Nigerian, a league of pastors and imams would take to the press each day to tell us what “God” allegedly told them about the man’s condition. One pastor – or imam – would say God told him to warn Nigerians to pray interminably and fast furiously to ensure the ailing elder’s survival. Another would declaim that God confided in him that Mr. Mandela did not hearken to some divine instruction – and so was put on Saint Peter’s list of guests to expect at the pearly gates. Yet another imam – or pastor – would declare that a clique of witches and wizards had descended on the sick man, determined to doom him. If he’s to survive, he must personally contact the clairvoyant imam or pastor to receive special instructions on how to win the spiritual warfare. Mr. Mandela is a man of comfortable means. He made a modest fortune from advances and royalties on books as well as earnings from his work as a widely sought, handsomely rewarded speaker on lecture circuits. He also received a Nobel Peace Prize that came with a handsome sum. In a word, he’s worked – and worked hard – for his money. Now, if Mr. Mandela were a Nigerian, he would be considered a capital fool for working at all to earn money. To work hard would make him nothing less than a mumu, a Nigerian parlance that suggests somebody is a step or two worse than a fool. No, he would simply announce himself, Obasanjo- or Anenih-like, as a major “stakeholder.” And then, pronto, some currency tap would start gushing cash onto the deep pockets of his agbada. (Which reminds me: if Mr. Mandela were a Nigerian, he would not be permitted to sport those silly shirts he’s seen in. With those shirts, who’s going to be able to tell oga apart from his houseboys? He must exchange them for an endless line of lavishly embroidered agbada, accentuating his image as a human god). If Mr. Mandela were a Nigerian, he would have enough cash stashed away in foreign vaults to make the Forbes list of the world’s billionaires. Heck, Nigerian civil servants who manage pension funds are billionaires! Yet – like most Nigerian billionaires – he would not be in a haste to alert the editors of Forbes to the size of his assets. Heh, it’s not worth the trouble; who wants to be playing hide-and-seek with armed robbers and kidnappers? He may not confide in Forbes, but a Nigerian Mandela would be the proud owner of numerous oil blocks. He would be entitled to a “security vote” that nets him, at least, a billion naira per month. He would own mansions in several European capitals and resort locations. He would own private jets, his own private army (otherwise known as thugs), a university or two, a private cathedral or mosque, controlling shares in several banks, and enough high-priced cars to run an automobile dealership. Mr. Mandela is an enlightened man, a towering moral figure who commands respect around the world, a lawyer, author and reader. Yes, he has the stamina to put in the months and years it takes to write a book. And he is capable of staying still for hours or days to read book. If he were a Nigerian big man, he’d love to have a book or two to his name – but the content would be cliché-riddled speeches written by bored, ill-educated and often cynical amanuenses. As for reading a book, perish the thought! A friend of mine once told a joke about one of Nigeria’s illiterate moneymen. According to him, this mind-ravaged rich man laughed at people who, behind his back, whispered that he was unlettered. “I can read,” said the traduced businessman. “I only care to read the amount on my checks!” That’s what a Nigerian Mandela would learn to do. If the legendary Mandela were a Nigerian, he would not be addressed simply as Mister. On Mandela’s first visit to Nigeria, he was awarded an honorary doctorate degree by – if my memory serves me – the University of Maiduguri. Since then, Nigerian newspapers and magazines as well as broadcast media have taken to addressing the global icon as “Dr.” Mandela. In the Nigerian media’s imagination, by bestowing the prefix “doctor” on Mandela, they have somehow enhanced the man’s standing in the world. What would the man be without this generous beneficence from Nigeria by way of Maiduguri? It’s conventional wisdom in Nigeria that titles, however hollow, matter. In many quarters, the quality of a person’s mind is of no consequence. What matters is self-advertisement, buttressed shamelessly in the adornment of antiquated, silly honorifics. So we went from addressing people as Chief (which has no meaning, really) to calling them High Chief, Double Chief, or Double High Chief – terms that inspire embarrassment on behalf of those who flaunt them. If Mandela were Nigerian, he would be identified as Triple High Chief (Sir) Barrister Nelson Mandela, GCFR, Tigbuo Zogbuo 1 of Igboland, Aare Baba Dudu 1 of Yorubaland, Alhaji Magajin Biu 1 of Hausaland, etc, etc. He would be overfed, weaned off his sprite, sportsman’s physique. With his kind of figure – a flat belly and all – you can’t even aspire to become a local government councilor in Nigeria! Day and night, his staff and harem would ply him with pomo stew, cow leg pepper soup, pounded yam and egusi washed down with six bottles of lager per session – until he’s appropriately fattened. 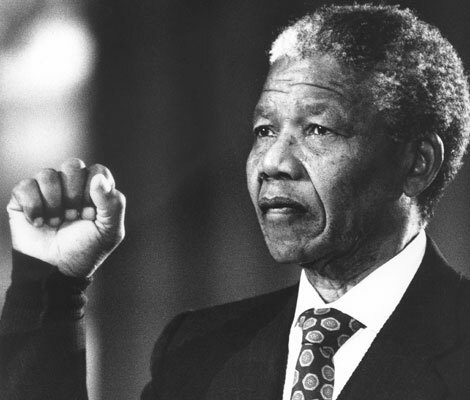 If Mr. Mandela were a Nigerian, his claim to being a hero would be put to the ethnic test. Only members of his ethnic group would consider him an exemplary man. To others, he would be an object of ambivalent response: a hero today, a villain tomorrow, depending on what he’s said on what issue. If Mr. Mandela were a Nigerian, he would never have spent more than one week in prison. Why, the traditional rulers from his district would have gone as a delegation to his jailers, apologized on his behalf for his unruly opposition to the apartheid machinery and pledged that they would ensure that he show appropriate respect to constituted authority. He would then be released – cameras clicking to capture the moment – to the “royal fathers,” guarantors of his docility, quiescence and submission to the powers-that-be. If Mr. Mandela were a Nigerian, he would not be an ex-president, but a president-for-life. His kinsmen would have hired a dibia, babalawo or malam to cure his “madness” when he decided to step aside after only one term as president. A Nigerian Mandela would not be subject to any constitutional limits on presidential terms; the constitution would be subject to him. Any part of the constitution that runs counter to his whims and caprices would be instantly amended or – better still – ignored. To make a short story long, if Mandela were a Nigerian, then the man and his stupendous moral capital would not exist!